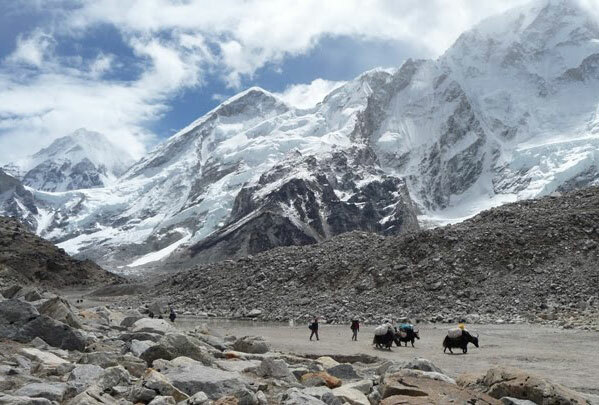 A challenging trek deep into the mountains of Nepal’s Khumbu Valley, crossing high passes and trekking up isolated glacier valleys with dramatic close-up views of 4 of the world’s eight highest peaks; Cho Oyu (8,201m), Makalu (8,463m), Lhotse (8,516 m) and Everest (8,850m). 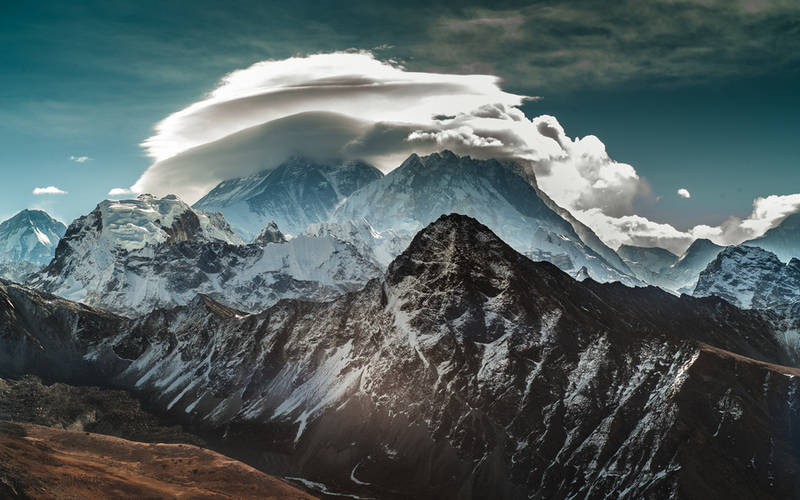 This is the High Himalaya. For those with some mountain experience an extra 2 days could include an ascent of Lobuche East, 6,119m, Alpine Grade ‘Peu Difficile’/not very difficult. 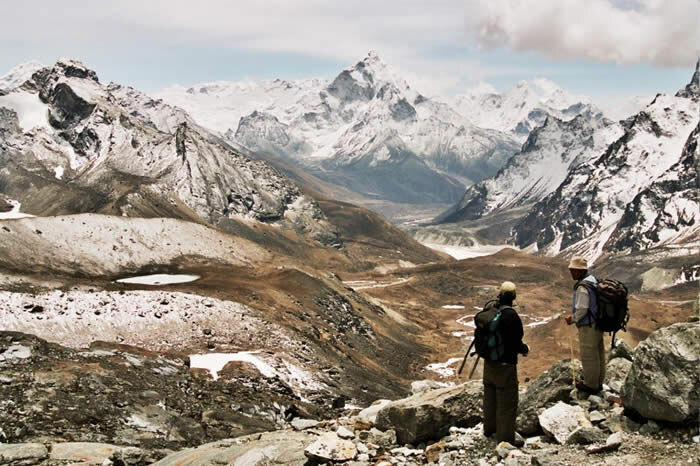 See Trekking Peaks – Lobuche. If you have the time it is strongly recommended to fly in lower down the valley to Phaplu and spending an extra three days hiking up to a point past Lukla. This is a great little add-on and gives you more time to get used to trekking and to adjust to altitude. 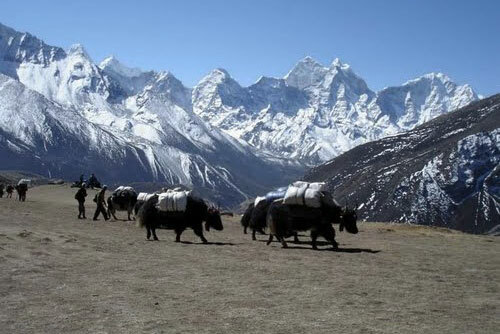 Alternatively we could get a bus (12-14 hours) (or private transport) to Shivalaya and trek in to Lukla in six days. Best done in October or November this trek could equally well be done in March, April or early May. This is a tea-house trek, ie with food and accommodation provided. Day 1 Kathmandu via Lukla to Phakding (2,650m) Your trekking guide will come to your hotel and, after breakfast, we take a spectacular 40 minute flight from Kathmandu to Lukla, perched at 2,860m in the Khumbu Valley, with unforgettable views of the terraced landscape and river valleys below, as well as close-ups of some of the world’s highest mountains. 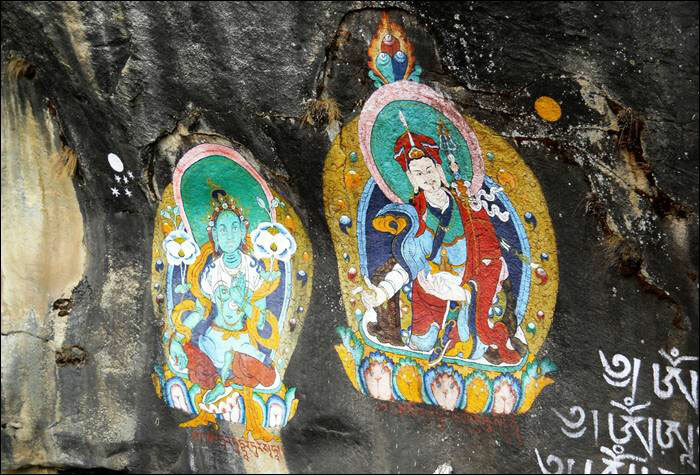 We then take a short hike to Phakding passing mani walls (rocks with carved Buddhist prayer inscriptions), small villages and terraced hillsides. (40 minutes flight and 3 hours trekking). Day 2 Phakding to Namche Bazaar (3,450m) The trek meanders up the Dudh Kosi (river) valley before we begin a steep uphill hike from where we’ll get our first view of Thamserku (6,623m), a peak rising to the east of Namche Bazaar. 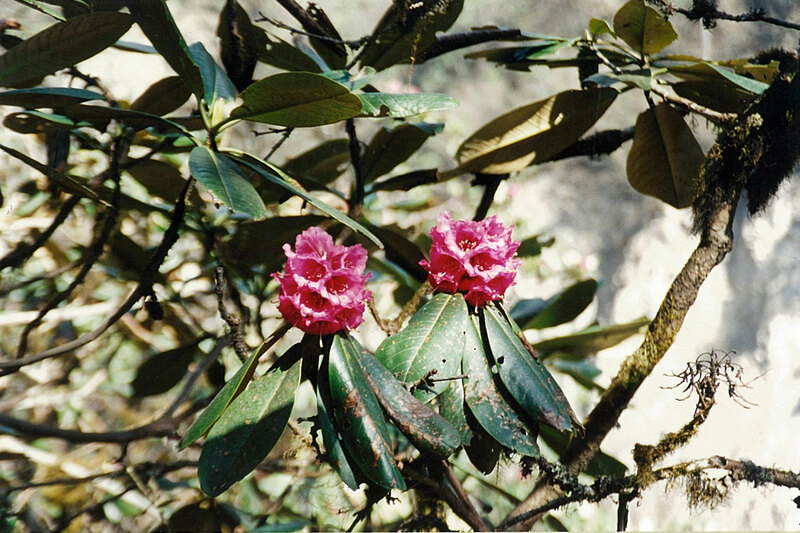 From the pretty village of Benkar the trek heads back to cross the Dudh Kosi before rising through magnificent forests of rhododendron, magnolia and fir interspersed with villages. The trek descends dramatically to recross the Dudh Kosi and from the confluence of the Dudh and Bhote Kosi we begin a 2 hour uphill hike through dense pine forests to Namche Bazaar, a busy attractive little trading town with shops, tea-houses, e-mail cafes etc. (6 hour trek). 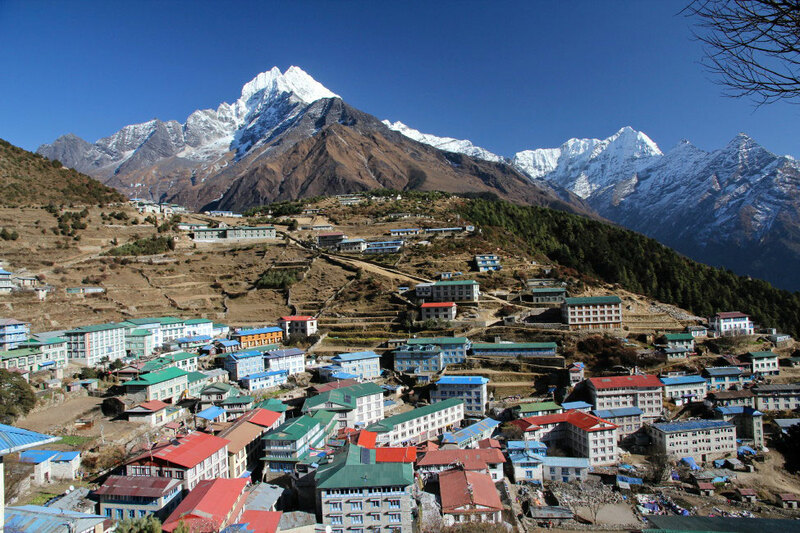 Day 3 An Acclimatization Day in Namche Bazaar Enjoy the beauty of this quaint village as well as the friendliness and hospitality of its people. 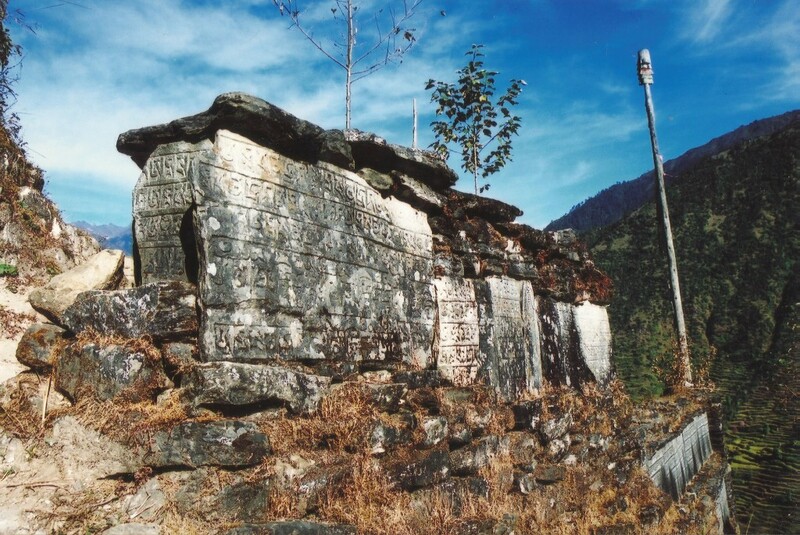 Trekkers may visit the local museum containing exhibits displaying the area’s native flora and fauna as well as the history of the Mt Everest region. 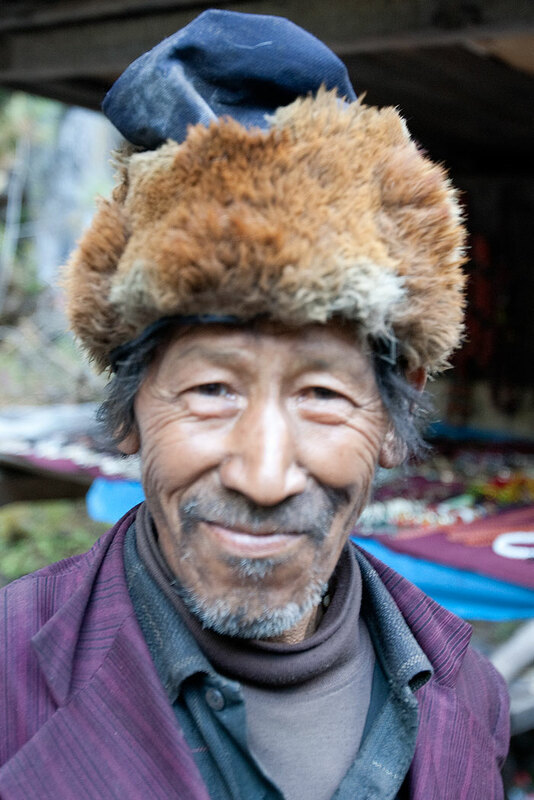 Other options include a 3 hour return trek to Chhorkung, a 6 hour return trek to Thame or a 4/5 hour round trek through the villages of Zarok, Shyangboche, Khunde and Khumjung with their awesome mountain backdrops. 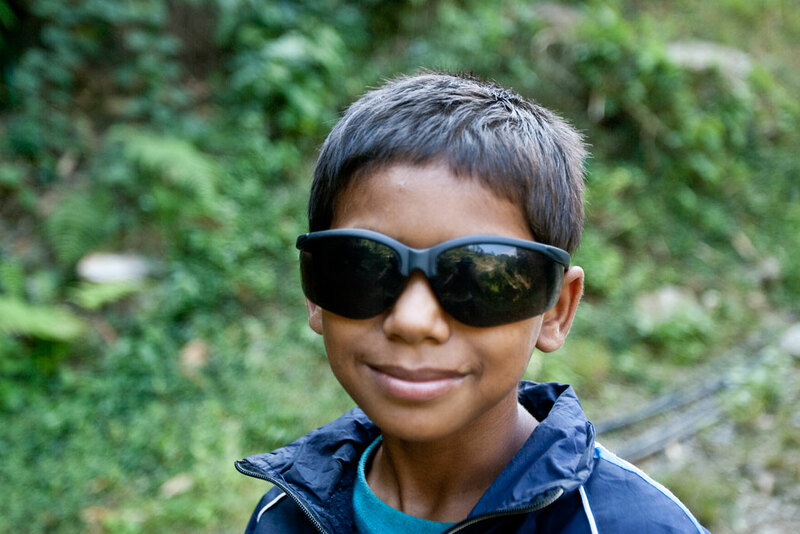 Ask your trekking guide for advice and company. On Saturday mornings the market is bigger. Day 4 Namche Bazaar to Thame (3,800m) We leave Namche Bazar and make a short uphill trek, before hiking downhill into the forest, with the river bed becoming closer and wider. We hike to the village of Phorte and then the small town of Samde halfway up a slope leading to a bridge over the Bhote Koshi (3,650 m). We cross the bridge and trek uphill for about 30 minutes to Thame. (4/5 hour trek). 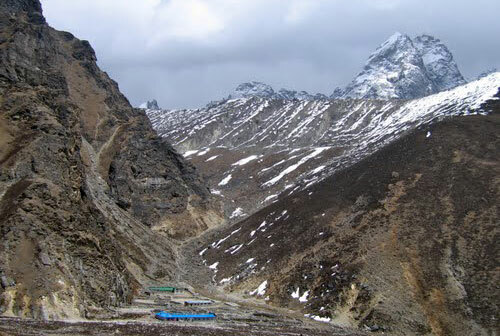 Day 5 Thame to Marulung (4,210m) The trek from Thame to Marlung is more mountainous and there is less vegetation. We enjoy the peace and solitude of this little trekked valley, enjoying the fab views. 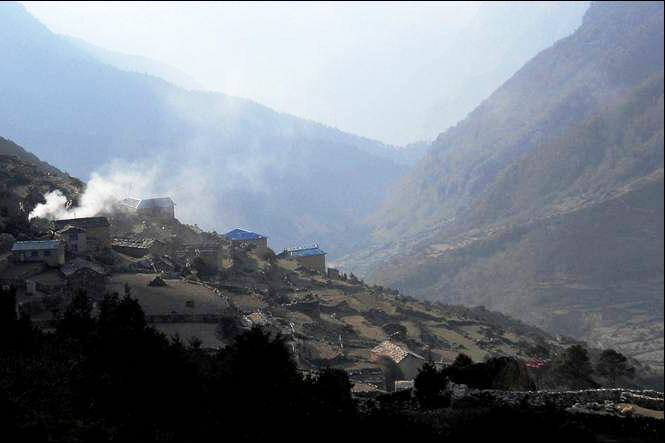 We hike past Tarngga village enjoying superb vistas of Kongde Ri (chain of mountains) as we look back down the trek. A further 45 minutes hiking on a gradually rising slope brings us to Marulung. (5/6 hour trek). Day 6 Marulung to Lungden (4,380m) Today is a short trek to Lungden, our last stop before the first pass, Renjo La. (3 hour trek). Day 7 Lungden to Gokyo (4,800m) We trek to Renjo La (pass), getting outstanding views of Everest, Lhotse, Cholatse and Taboche. 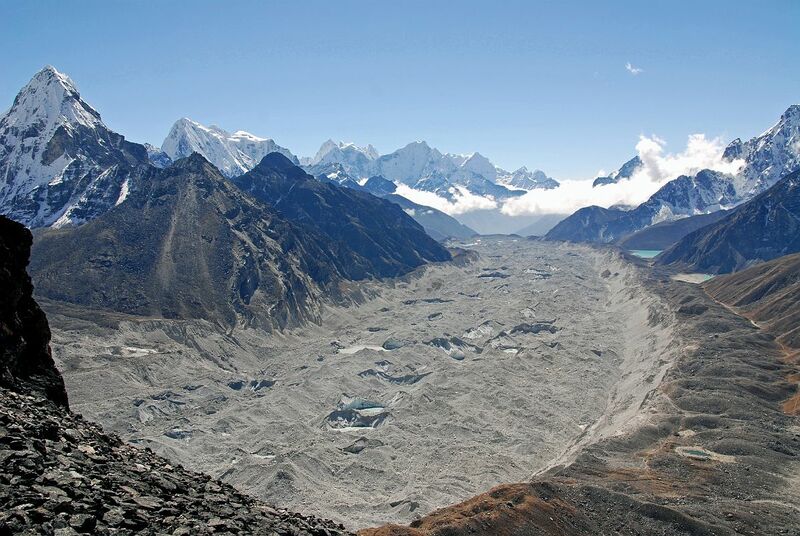 From Renjo La we can see Gokyo Tsho, the 3rd of the sacred lakes, and Gokyo village beneath the grey smudge of Ngozumpa Glacier. 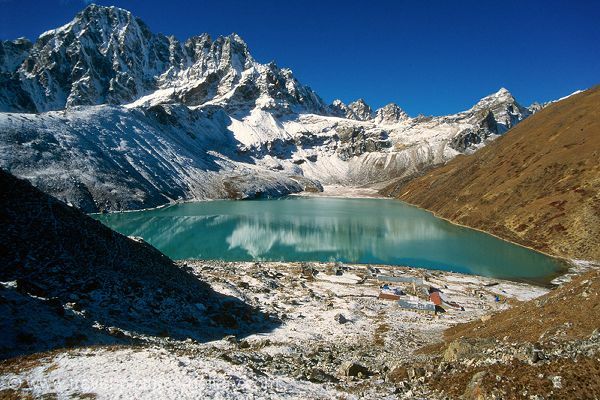 We hike down to Gokyo. (8 hour trek). Day 8 Rest Day This is a day to explore the area. Wake up early morning for the must-do hike up Gokyo Ri (5,483m) for great views including Everest and Makalu, (4 hours return). In the afternoon trek up to the 4th and 5th lakes, Thonak Tsho and Ngozumpa Tsho, and back (allow 5 hours there and back and take a guide). 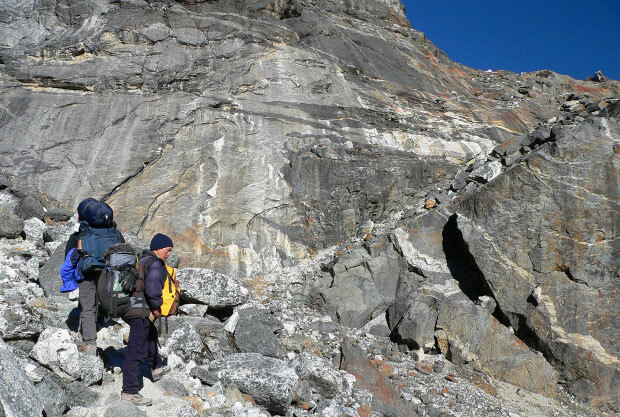 In addition between Thonak and Ngozumpa Tshos there are 3 fingers of rock, the ‘Nameless Towers’, the lowest of which (5,500m) is a fun scramble to the summit, allow 8 hours to get there, up, down and back and take a guide. Day 9 Gokyo to Dragnag (4,700m) We trek out of Gokyo and hike down past Taboche Tsho and Longponga Tsho, the first 2 of the lakes, and turn east over the glacier and take the short hike to Dragnag. NB the hike up Gokyo Ri could be done on this morning. (2 hour trek). Day 10 Dragnag via Cho La (5,420m) to Dzonglha (4,830m) We need to start trekking early, with a packed lunch, to avoid the clouds. The trek climbs the valley before crossing boulders to the scree slopes below the pass. The pass itself is always icy and there may be quite deep snow. The hike down is tricky and you should stick close to your guides for this. During the hike down you will have a permanent view of Ama Dablam, 6,856m, framed in the end of the valley. (This is the hardest day of the trek). (7 hour trek). Day 11 Dzonglha to Lobuche (4,910m) We hike down southeast and turn to the north. Pheriche and Dhugla should be visible and we, of course, have great views of the mountains surrounding us. We now rejoin the main trekking route to Kala Pattar, Gorak Shep and EBC. (4 hour trek). Day 12 Lobuche to EBC to Gorak Shep (5,190m) Trekking up the Khumbu Valley we pass Gorak Shep and after hiking along the glacier we reach the only let down of the trek, the rather squalid Everest Base Camp with its distinct lack of views. After a deserved cup of tea we trek back to Gorak Shep. (9 hour trek). Day 14 Lobuche via Kongma La (5,535m) to Chhukung (4,730m) From Lobuche we trek across the Khumbu Glacier and hike up to Kongma La, enjoying views of the wide basin dotted with frozen lakes and the marvelous vistas of Cholatse, Pokalde, Nuptse, Lhotse, Makalu and Ama Dablam. 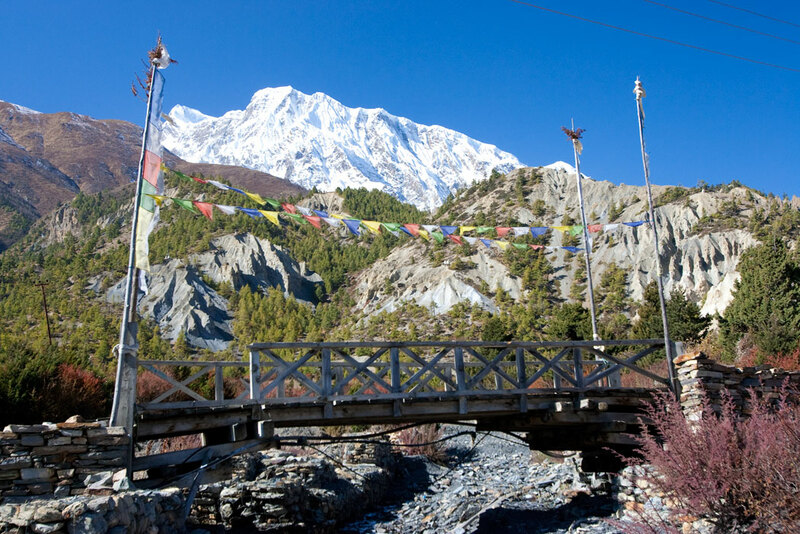 While trekking down into the Niyang Khola valley, we can see Amphu Lapcha Pass and Island Peak. We hike on to Chukkung. (6 hour trek). Day 15 Chhukung to Tengboche (3,860m) Leaving behind the views of the High Himalaya we trek down to Tengboche with its gompa (monastery), a World Heritage Site, which may be visited for self-purification (go on you need it). 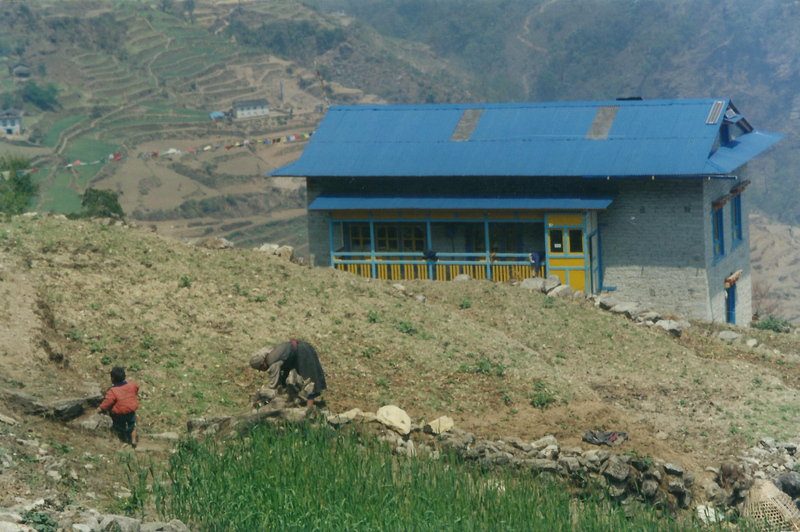 The gompa has a library and cultural centre plus a school, which educates about 30 young monks. (6 hour trek). Day 16 Tengboche to Namche Bazaar (3,450m) After an early morning view of Mt Everest from just above the lodge we trek back via Sanasa and Khumjung to Namche Bazaar. (4 hour trek). Day 17 Namche Bazaar to Lukla (2,850) We trek downhill through the pine forest, leaving behind Everest, crossing several bridges on the Dudh Kosi to greener vegetation and cultivation among the Sherpa villages. And that’s almost it for this year. (6 hours). Day 18 Lukla to Kathmandu A hair-raising take-off down the runway commences the return flight to Kathmandu. Don’t worry though, it’s not true that the planes take off and glide before starting the engines! We hope you’ve had a great trek, some once in a lifetime experiences, tightened your belt a few notches, have lots of fond memories and, of course, we look forward to trekking again with you on your return to Nepal. Price US$ 1,700 plus accommodation in Kathmandu. Price includes Airport pick-ups and drop-offs. All inclusive trek costs; accommodation in twin shared rooms, breakfast, lunch, dinner, trekking and park permit fees, guide and necessary porters and all their costs such as transportation, accommodation, food, equipment, insurance etc. The flights from Kathmandu-Lukla-Kathmandu.